› Author AffiliationsC.G. held a doctoral fellowship from la region Auvergne Rhône Alpes. The authors are grateful to the CNRS, ICBMS (UMR 5246), ICL (Institut de Chimie de Lyon) for financial support. The French Fluorine Network as well as the federation RENARD are also acknowledged for their support. 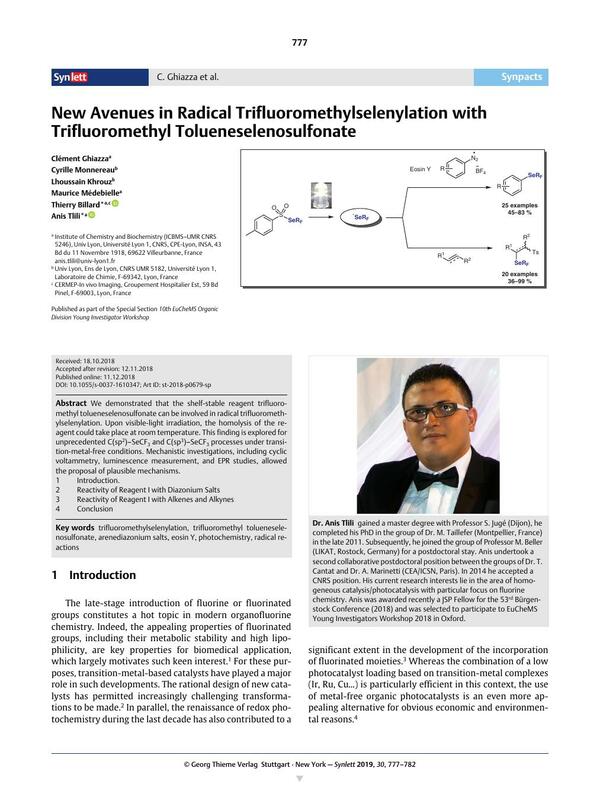 We demonstrated that the shelf-stable reagent trifluoromethyl tolueneselenosulfonate can be involved in radical trifluoromethylselenylation. Upon visible-light irradiation, the homolysis of the reagent could take place at room temperature. This finding is explored for unprecedented C(sp2)–SeCF3 and C(sp3)–SeCF3 processes under transition-metal-free conditions. Mechanistic investigations, including cyclic voltammetry, luminescence measurement, and EPR studies, allowed the proposal of plausible mechanisms. 7c Baran PS, Merchant RR, Edwards JT, Qin T, Kruszyk MM, Bi C, Che G, Bao D.-H, Qiao W, Sun L, Collins MR, Fadeyi OO, Gallego GM, Mousseau JJ, Nuhant P. ChemRxiv, Preprint 2017; DOI: DOI: 10.26434/chemrxiv.5715106.v1.